“The keenest observer makes use of every kind of sensory information. In fact, the greatest insights often come to individuals who are able to appreciate the sublimity of the mundane, the deeply surprising and meaningful beauty of everyday things.”……….David Jiles, PhD.from his book, ReThinking Thinking, and the article, Observation, at Creativity-Portal. I’ve often reminded myself (well, not often, but you know what I mean), when I see something so mundane as a barn or an apple or “whatever” painted in some new or different perspective. We all should slow down and take time to really observe. I’m consumed with this slowing down lately it seems as everything in my life seems to speed up. 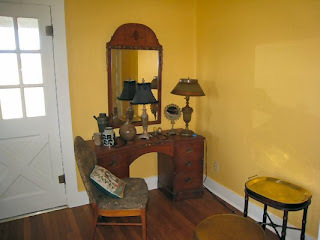 I’ve always loved be be in on the action….but only in drips and drabs enough to keep me energized. Without the times “out”, what would I have to promote what I love……the distillation of life in my work. Too much rain..and other stuff! Not much going on other that meeting myself coming and going out to the farm over the past week. 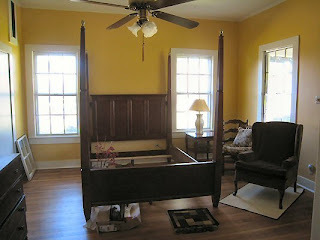 I took a couple of pictures in the front bedroom and then forgot after we got the canopy framework up to take another. As you can see there is a lot of stuff piled up where it doesn’t belong as we paint from room to room and move things out of adjacent areas. 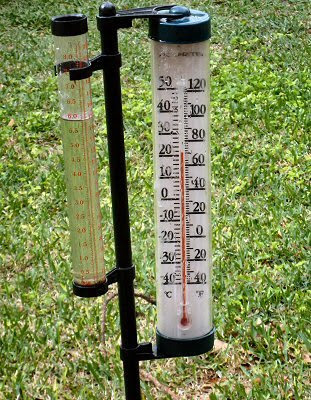 Ooooh……..and the picture of almost 6″ in the rain gauge overnight with the storms coming through here. My daughter had a window broken in her kitchen from the hail. This was made at the house but it was terrible like this out at the farm, too……..no broken windows though there. That painting I was lamenting over not long ago is finally finished. I could think of nothing to title it other than “Excavation”………pun could be meant here since there was a lot of that going on while painting this one. It sure went through the “uglies”. But it also reminds me of excavation of other kinds as well since there is some of that going on around this area with gas and oil exploration and coal mining. Today, I finally got around to reading some of a “newsletter” of sorts I subscribe to. It’s called Creativity Portal and they have so many articles from various artists that are “spot on” for me. For instance, this one really spoke to me since I’ve been running around like a crazy person lately and really needing some quiet time. They ask that people link directly rather than quote so here it is……just scroll down to the article by Don Richmond……..Space and Stillness. I am so proud and happy about some news I received recently. Nita Leland has been writing a new book on color for the past two years. Her publishers chose one of my paintings for the cover……….. 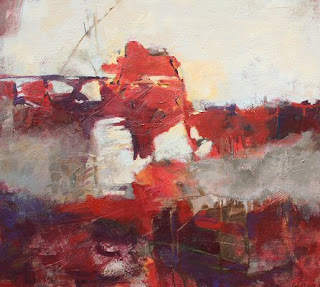 Confident Color: An Artists Guide to Harmony, Contrast and Unity. Here’s a link to Nita’s blog with a link to article that just came out about it.